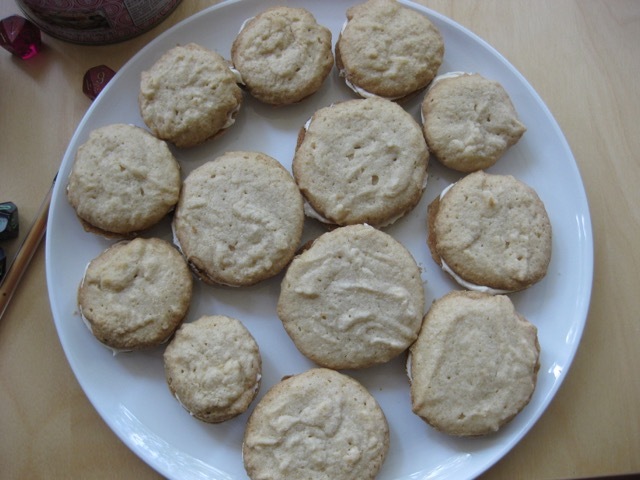 I recently brought back a box of maple cream cookies from Toronto for my friends – but I wanted everyone to have some Canadian dessert, so I baked gluten-free ones too. The gluten-free cookies are much softer and fluffier than the regular kind, and I think I actually prefer them! Beat together sugar, salt, baking powder, vanilla, maple flavoring (if you have it), and butter until fluffy. Mix in flour. Add more maple syrup if the dough doesn’t stick together. It will be pretty wet. Drop dough on baking sheet in one-teaspoon dollops. Bake for 12 min if using gluten-free flour OR 8-10 min if using normal flour. The edges will be lightly browned. Let them cool completely. While cookies are cooling, make the filling: beat together confectioners’ sugar, butter, and salt. Add vanilla extract, maple syrup, and maple extract if you have it. Beat until smooth. Spread filling on one cookie and then top with another to make a sandwich. Let the cookie sandwiches sit until the filling sets. Eat any leftover cookies! The recipe makes about 18 cookie sandwiches.